Click a past invoice to view a copy of the receipt. As the account owner, you'll also receive an email once a month with your Noko receipt. If we can't charge your card, you'll receive an email about a charge failure instead. Note that if you have paid in advance, you'll only receive monthly receipts again once we start billing you again after your advance payment runs out. You can also add any additional email addresses to automatically email Noko invoices to your accountant or billing department. If you live in a country with strict business tax laws, and need to add extra information to appear on your Noko receipt, you can! You can add any information to your Noko invoice that you need. Under the Have special invoice needs? heading enter any additional information you need, such as tax ID numbers or contact persons. If you use this feature, we won't include the address that's listed under Billing Address, so be sure to add your address in the custom 'Bill To' field as well. 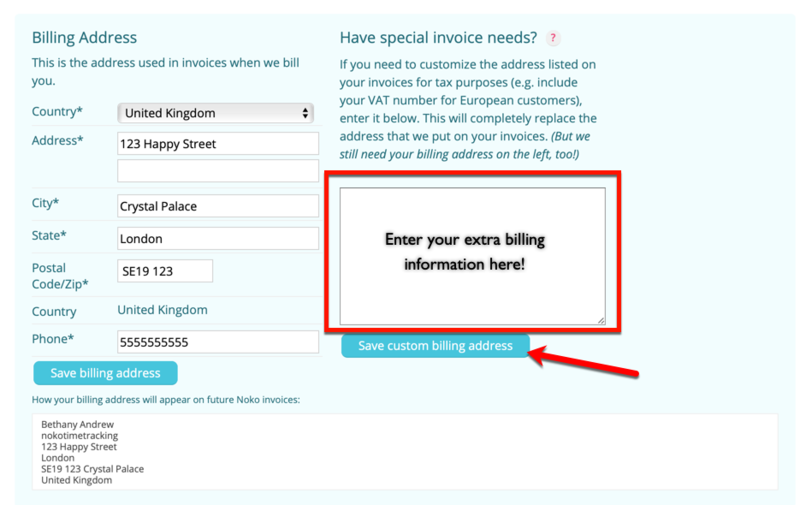 When you've entered all of the extra billing information you need click the Save custom billing address button. Your new custom billing information will be included from your next receipt forward. Important: We recommend asking an accredited tax consultant about any tax requirements in your country and for your company as we unfortunately aren't able to provide accounting, bookkeeping or tax advice.